Stoker was born on 8 November 1847 at 15 Marino Crescent, Clontarf, on the northside of Dublin, Ireland. His parents were Abraham Stoker (1799–1876) from Dublin and Charlotte Mathilda Blake Thornley (1818–1901), who was raised in County Sligo. Stoker was the third of seven children, the eldest of whom was Sir Thornley Stoker, 1st Bt. Abraham and Charlotte were members of the Church of Ireland Parish of Clontarf and attended the parish church with their children, who were baptised there. After his recovery, he grew up without further serious illnesses, even excelling as an athlete (he was named University Athlete) at Trinity College, Dublin, which he attended from 1864 to 1870. He graduated with honours as a B.A. in Mathematics. He was auditor of the College Historical Society (the Hist) and president of the University Philosophical Society, where his first paper was on Sensationalism in Fiction and Society. In 1878 Stoker married Florence Balcombe, daughter of Lieutenant-Colonel James Balcombe of 1 Marino Crescent. She was a celebrated beauty whose former suitor was Oscar Wilde. Stoker had known Wilde from his student days, having proposed him for membership of the university’s Philosophical Society while he was president. Wilde was upset at Florence's decision, but Stoker later resumed the acquaintanceship, and after Wilde's fall visited him on the Continent. The Stokers moved to London, where Stoker became acting manager and then business manager of Irving's Lyceum Theatre, London, a post he held for 27 years. On 31 December 1879, Bram and Florence's only child was born, a son whom they christened Irving Noel Thornley Stoker. The collaboration with Henry Irving was important for Stoker and through him he became involved in London's high society, where he met James Abbott McNeill Whistler and Sir Arthur Conan Doyle (to whom he was distantly related). Working for Irving, the most famous actor of his time, and managing one of the most successful theatres in London made Stoker a notable if busy man. He was dedicated to Irving and his memoirs show he idolised him. In London Stoker also met Hall Caine, who became one of his closest friends – he dedicated Dracula to him. In the course of Irving's tours, Stoker travelled the world, although he never visited Eastern Europe, a setting for his most famous novel. Stoker enjoyed the United States, where Irving was popular. With Irving he was invited twice to the White House, and knew William McKinley and Theodore Roosevelt. Stoker set two of his novels there, using Americans as characters, the most notable being Quincey Morris. He also met one of his literary idols, Walt Whitman. 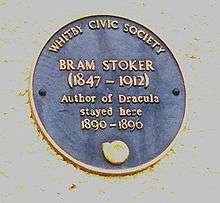 Stoker visited the English town of Whitby in 1890, and that visit is said to be part of the inspiration of his great novel Dracula. He began writing novels while manager for Henry Irving and secretary and director of London's Lyceum Theatre, beginning with The Snake's Pass in 1890 and Dracula in 1897. During this period, Stoker was part of the literary staff of the The Daily Telegraph in London, and he wrote other fiction, including the horror novels The Lady of the Shroud (1909) and The Lair of the White Worm (1911). He published his Personal Reminiscences of Henry Irving in 1906, after Irving's death, which proved successful, and managed productions at the Prince of Wales Theatre. The original 541-page typescript of Dracula was believed to have been lost until it was found in a barn in northwestern Pennsylvania in the early 1980s. It consisted of typed sheets with many emendations, plus handwritten on the title page was "THE UN-DEAD." The author's name was shown at the bottom as Bram Stoker. Author Robert Latham remarked: "the most famous horror novel ever published, its title changed at the last minute." The typescript was purchased by Microsoft co-founder Paul Allen. Stoker's original research notes for the novel are kept by the Rosenbach Museum and Library in Philadelphia, PA. A facsimile edition of the notes was created by Elizabeth Miller and Robert Eighteen-Bisang in 1998. After suffering a number of strokes, Stoker died at No. 26 St George's Square on 20 April 1912. Some biographers attribute the cause of death to tertiary syphilis, others to overwork. He was cremated, and his ashes were placed in a display urn at Golders Green Crematorium. After the death of Stoker's son, Irving Noel Stoker in 1961, Irving's ashes were added to that urn. The original plan had been to keep his parents' ashes together, but after Florence Stoker's death, her ashes were scattered at the Gardens of Rest. Visitors to Stoker's urn at Golders Green are escorted to the room as a precaution against vandalism. Stoker was raised a Protestant in the Church of Ireland. He was a strong supporter of the Liberal Party and took a keen interest in Irish affairs. As a "philosophical home ruler," he supported Home Rule for Ireland brought about by peaceful means. He remained an ardent monarchist who believed that Ireland should remain within the British Empire, an entity that he saw as a force for good. He was an admirer of Prime Minister William Ewart Gladstone, whom he knew personally, and supported his plans for Ireland. Stoker believed in progress and took a keen interest in science and science-based medicine. Some Stoker novels represent early examples of science fiction, such as The Lady of the Shroud (1909). He had a writer's interest in the occult, notably mesmerism, but despised fraud and believed in the superiority of the scientific method over superstition. Stoker counted among his friends J. W. Brodie-Innis, a member of the Hermetic Order of the Golden Dawn, and hired member Pamela Colman Smith as an artist for the Lyceum Theatre, but no evidence suggests that Stoker ever joined the Order himself. The short story collection Dracula's Guest and Other Weird Stories was published in 1914 by Stoker's widow, Florence Stoker, who was also his literary executrix. The first film adaptation of Dracula was F. W. Murnau's Nosferatu, released in 1922, with Max Schreck starring as Count Orlock. Florence Stoker eventually sued the filmmakers, and was represented by the attorneys of the British Incorporated Society of Authors. Her chief legal complaint was that she had neither been asked for permission for the adaptation nor paid any royalty. The case dragged on for some years, with Mrs. Stoker demanding the destruction of the negative and all prints of the film. The suit was finally resolved in the widow's favour in July 1925. A single print of the film survived, however, and it has become well known. The first authorised film version of Dracula did not come about until almost a decade later when Universal Studios released Tod Browning's Dracula starring Bela Lugosi. 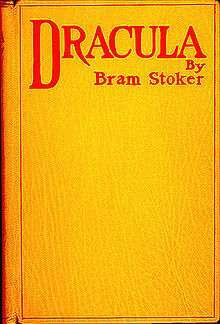 Canadian writer Dacre Stoker, a great-grandnephew of Bram Stoker, decided to write "a sequel that bore the Stoker name" to "reestablish creative control over" the original novel, with encouragement from screenwriter Ian Holt, because of the Stokers' frustrating history with Dracula's copyright. In 2009, Dracula: The Un-Dead was released, written by Dacre Stoker and Ian Holt. Both writers "based [their work] on Bram Stoker's own handwritten notes for characters and plot threads excised from the original edition" along with their own research for the sequel. This also marked Dacre Stoker's writing debut. In Spring 2012, Dacre Stoker (in collaboration with Prof. Elizabeth Miller) presented the "lost" Dublin Journal written by Bram Stoker, which had been kept by his great-grandson Noel Dobbs. Stoker's diary entries shed a light on the issues that concerned him before his London years. A remark about a boy who caught flies in a bottle might be a clue for the later development of the Renfield character in Dracula. On 8 November 2012, Stoker was honoured with a Google Doodle on Google's homepage commemorating his 165th birthday. An annual festival takes place in Dublin, the birthplace of Bram Stoker, in honour of his literary achievements. The 2014 Bram Stoker Festival encompassed literary, film, family, street, and outdoor events, and ran from 24–27 October in and around Dublin City. The festival is supported by the Bram Stoker Estate and funded by Dublin City Council and Fáilte Ireland. "The Question of a National Theatre" The Nineteenth Century and After, Vol. LXIII, January/June 1908. "Mr. De Morgan's Habits of Work" The World's Work, Vol. XVI, May/October 1908. "The Censorship of Fiction" The Nineteenth Century and After, Vol. LXIV, July/December 1908. "The Censorship of Stage Plays" The Nineteenth Century and After, Vol. LXVI, July/December 1909. "Irving and Stage Lightning" The Nineteenth Century and After, Vol. LXIX, January/June 1911. ↑ Murray, Paul (2004). From the Shadow of Dracula: A Life of Bram Stoker. Random House. p. 11. ISBN 0224044621. ↑ "Why Dracula never loses his bite". Irish Times. 28 March 2009. ↑ "Vampires - Top 10 Famous Mysterious Monsters - TIME". TIME.com. 14 August 2009. ↑ John J. Miller (28 October 2008). "What a Tax Lawyer Dug Up on 'Dracula'". WSJ. ↑ Boylan, Henry (1998). A Dictionary of Irish Biography, 3rd Edition. Dublin: Gill and MacMillan. p. 412. ISBN 0-7171-2945-4. ↑ "Bram Stoker". Victorian Web. 30 April 2008. Retrieved 12 December 2008. ↑ Gibson, Peter (1985). The Capital Companion. Webb & Bower. pp. 365–366. ISBN 0-86350-042-0. ↑ The Discussion (Third ed.). Grade Eight – Bram Stoker: Oberon Books (for The London Academy of Music and Dramatic Arts). 2004. p. 97. ISBN 1-84002-431-3. ↑ Murray, Paul. From the Shadow of Dracula: A Life of Bram Stoker. 2004. ↑ "Shadowplay Pagan and Magick webzine – HERMETIC HORRORS". Shadowplayzine.com. 16 September 1904. Archived from the original on 9 November 2009. Retrieved 18 June 2012. ↑ Ravenscroft, Trevor (1982). The occult power behind the spear which pierced the side of Christ. Red Wheel. p. 165. ISBN 0-87728-547-0. ↑ Picknett, Lynn (2004). The Templar Revelation: Secret Guardians of the True Identity of Christ. Simon and Schuster. p. 201. ISBN 0-7432-7325-7. 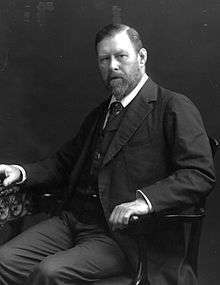 ↑ "Bram Stoker's 165th Birthday". ↑ Doyle, Carmel (8 November 2012). "Bram Stoker books: gothic Google Doodle honours Dracula author". Silicon Republic. Retrieved 8 November 2012. 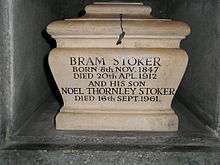 ↑ "Bram Stoker Festival - 28-31 Oct 2016 - Day & Night Events". Bram Stoker Festival 2015. ↑ "What's on in Dublin - Dublin Events, Festivals, Concerts, Theatre, family events - Visit Dublin". ↑ "The Bram Stoker Festival in Dublin- 2013 Events". Bram Stoker's Dracula Full text of Stoker's novel Dracula. "Bram Stoker". Find a Grave. Retrieved 8 February 2014.